This is definitely not something I want in production code, as it does not verify the server certificate and would allow a ‘men in the middle’ attack (see “Enable Secure Communication with TLS and the Mosquitto Broker“). This article explains how to enable and use certificate verification with mbed TLS and mosquitto as MQTT broker. For all the previous steps, please have read to the articles in the ‘Links’ section at the end of this article. 1492938937: Config loaded from mosquitto.conf. 1492938937: Opening ipv6 listen socket on port 8883. 1492938937: Opening ipv4 listen socket on port 8883. 1492934878: Socket error on client <unknown>, disconnecting. 0020 - 40 38 ef 86 2a 12 59 cb-f0 60 0d 34 e6 be 2a ef   @8..*.Y..`.4..*. 0060 - d7 b1 6b 82 63 34 fc c8-9c 2c a6 16 a2 73 75 9d   ..k.c4...,...su. 0070 - 33 03 dc c7 db e0 c7 89-d0 49 ac fd 7d d3 33 0e   3........I..}.3. 0080 - 35 eb df fc 05 b3 d0 bb-b7 02 25 67 86 71 76 f4   5.........%g.qv. 00a0 - b9 bf f1 99 5e c5 15 3c-ae 60 60 cb 8e 63 1a af   ....^..<.``..c..
Ah, that makes sense: I have used a self-signed certificate :-). Now I know why I have to use the option –insecure with mosquitto_sub. I guess I could get rid of this with an non-self-signed certificate, but that’s too much of an effort for me now, as I’m only testing the connection. mqtt_publish: Publish with payload length 1 to topic "HSLU/test"
For debugging purposes it is fine to skip the server certificate verification. But for production code the server certificate needs to be verified to prevent ‘men in the middle attacks’. Moving from ‘no certificate verification’ to the ‘verify the certificate’ requires parsing and using the server certificate. This can be accomplished with a few calls to the mbed TLS library and does not add that much code size compared to the overall mbed library, but greatly extends security. 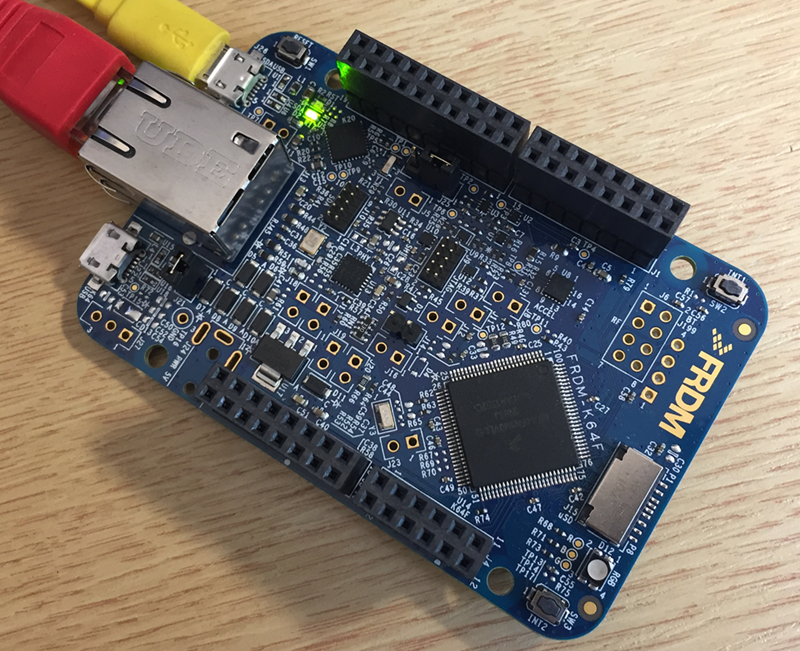 This entry was posted in ARM, Boards, Cortex, CPU's, Embedded, FRDM-K64F120M, Kinetis, mbed, MCUXpresso, MCUXpresso IDE, MQTT, NXP, Tutorial by Erich Styger. Bookmark the permalink. ups! Thanks for catching this! for the connection log you said that you’ve implemented in this project a command line interface. How can I reach/make this command interface? Connect with a console (38400 baud) to the OpenSDA virtual COM port. The application implements a command line shell. first of all thanks for your past comments. They were really helpful. I’m connecting now my board Segger J-Link through the OpenSDA. I connected a console (38400 baud) to the OpenSDA /dev/ttyACM0 /* because linux*/. The Peripherals has been checked with only UART0 (38400 baud). 1- when I command in the terminal (e.g. CMD> help) then I get outputs just like above but they don’t look orderly, I mean the words and the lines. 2- In the Preocessor Expert/ Components/ e.g. CLS1:Shell, they could not be configured. When I selct one of them then I get ” The component $name$ is not installed in this version of Processor Expert”. 1) what do you get here? It could be that you have a problem on your host? 2) That would be a problem. Do you have the latest components from SourceForge already (https://mcuoneclipse.com/2018/09/30/mcuoneclipse-components-30-sept-2018-release/)? 1- Yes! You’re right, I tried it in another host then it came normally. 2- No. I don’t have it! I installed it but how can I add it? your link hier https://mcuoneclipse.com/2014/10/21/mcuoneclipse-releases-on-sourceforge/ was very helpful to add the components. In the Peripherals settings I get the warning “Peripheral UART0 is not initialized”. Which settings should be made exactly for the Peripherals? I’m really not sure from where this warning is coming from? It seems that you don’t correctly initialize the UART0. I don’t get that message from my project on GitHub.